With iPad and tablets commonplace in most offices and organisations, ensuring an ergonomic posture with their use is vital. Tablets haven't been designed with ergonomics in mind as they encourage hand-held use and a hunched posture. Our tablet keyboards improve posture by increasing the distance between the user and their tablet - also reducing strain on the eyes. For a fully ergonomic tablet solution, use a tablet keyboard with one of our iPad & tablet stands. Why use a tablet keyboard? Tablets do not promote good posture as users typically hold them when viewing and typing anything on-screen. This forces a hunched posture and places stress and strain on the eyes, shoulders, neck and back. By using one of our tablet keyboards, the iPad or tablet can be positioned on the desk and used as a monitor when writing emails or documents. This avoids any hand-held use and any unnecessary strain being placed on the body - helping to prevent conditions such as repetitive strain. Typing comfort is also improved with one of our tablet keyboards. Typing on a hard tablet screen can cause pressure on the fingers - our tablet keyboards create a softer touch and enable dual handed use to spread the workload between both hands. 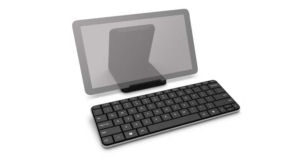 All of our tablet keyboards are extremely portable making them ideal for mobile workers, whilst the Bluetooth technology makes connecting to devices effortless. Order a tablet keyboard today!